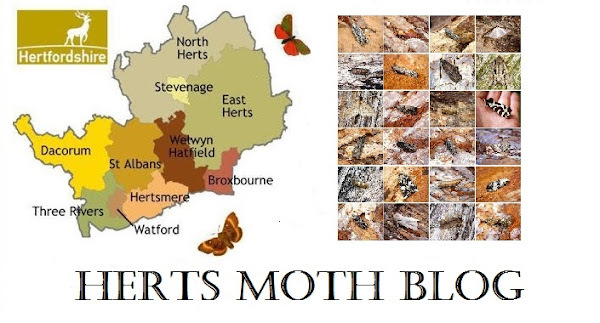 I made another trip over to Hemel Hempstead, and joined three other keen chaps in search of some autumnal moths. David had setup 2 traps at Gadesprings ready to go on at dusk, we then all met up at the old barn about half a mile away as the crow flies, intending on going back later and emptying the two traps at Gadesprings. I arrived at the barn at 6.40pm and the night was already drawing in, it was mild and muggy with reasonable cloud cover. I set-up the MV trap near the barn and the Actinic suitcase trap near the entrance to Hay Wood. The other trap was the blended mercury bulb and was postioned at the other side of Hay Wood running off the genny. At about 9pm the sky started to clear and the temperature got a little on the chilly side, we decided to abandon the far trap and there really was not much of note in it, off the top of my head just 4 moths which was terrible. The same had to be said for the suitcase Actinic, a small handful of Setaceous Hebrew Characters was all it had to offer. The brightest of them all up by the barn, faired much better with about 15 moths in total, again not a great deal. Of the species we trapped of note were a second brood Gold Triangle, Oak Nycteoline and Acleris rhombana. At Gadesprings, it was even worse with just 10 moths to two traps, best of all was a single Rush Veneer. All in all it was nice to add some Autumn moths to the site lists.